Strengthen and protect, O God, all those who suffer for their fidelity to Jesus Christ, that like thy servant Toyohiko Kawaga, they might persevere in seeking and serving Christ in all persons, and work tirelessly for the advancement of thy kingdom. All this we ask through the same Jesus Christ our Lord, to whom with thee and the Holy Ghost be all honor and glory now and forever. Amen. Strengthen and protect, O God, all those who suffer for their fidelity to Jesus Christ, that like your servant Toyohiko Kawaga, they might persevere in seeking and serving Christ in all persons, and work tirelessly for the advancement of your kingdom. All this we ask through the same Jesus Christ our Lord, to whom with you and the Holy Spirit be all honor and glory now and forever. Amen. Toyohiko Kagawa was born in 1888 in Kobe, Japan. Orphaned early, he lived first with his widowed stepmother and then with an uncle. He enrolled in a Bible class in order to learn English, and in his teens he became a Christian and was disowned by his family. In his late teens, he attended Presbyterian College in Tokyo for three years. He decided that he had a vocation to help the poor, and that in order to do so effectively he must live as one of them. Accordingly, from 1910 to 1924 he lived for all but two years in a shed six feet square (about 180 cm) in the slums of Kobe. In 1912 he unionized the shipyard workers. He spent two years (1914-1916) at Princeton studying techniques for the relief of poverty. In 1918 and 1921 he organized unions among factory workers and among farmers. He worked for universal male suffrage (granted in 1925) and for laws more favorable to trade unions. In 1923 he was asked to supervise social work in Tokyo. His writings began to attract favorable notice from the Japanese government and abroad. He established credit unions, schools, hospitals, and churches, and wrote and spoke extensively on the application of Christian principles to the ordering of society. 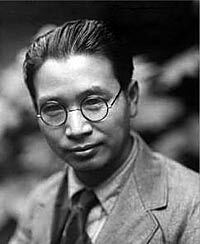 He founded the Anti-War League, and in 1940 was arrested after publicly apologizing to China for the Japanese invasion of that country. In the summer of 1941 he visited the United States in an attempt to avert war between Japan and the US. After the war, despite failing health, he devoted himself to the reconciliation of democratic ideals and procedures with traditional Japanese culture. He died in Tokyo 23 April 1960.